✈️ Art History Trip to Florence! Last week, we went on a fieldtrip to Florence with the Art History side of my course (BA Fine Art and Art History). It was a fully-funded trip, and after our module last term on the Renaissance, it was amazing to see all the artworks that we had studied in real life and understand the city first-hand. I thought I would share what it is like to go on a fieldtrip at university! On the Monday, we flew from Bristol airport to Pisa, and then got on a coach to Florence where we arrived at our hotel. It was right by the river and we were on the top floor so the views were pretty nice! 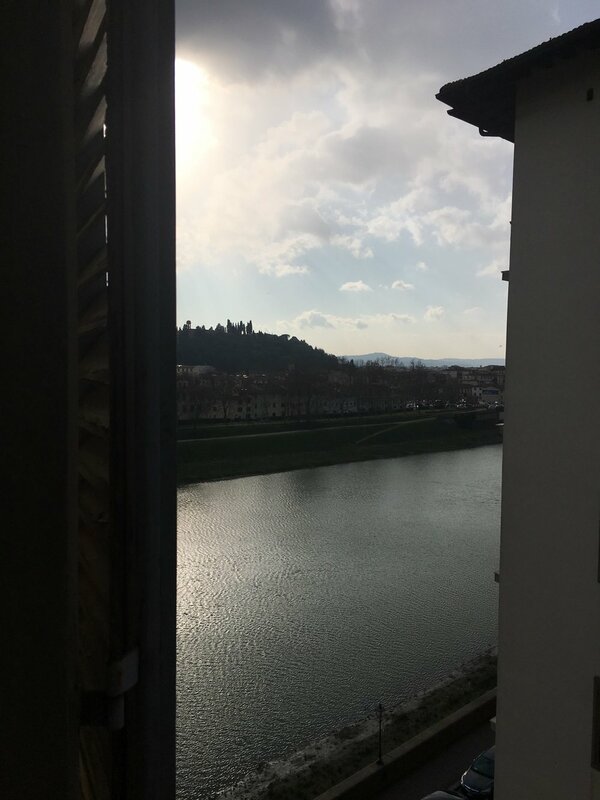 That evening, we climbed up the 414 steps of ‘Giotto’s Bell Tower’ to watch the sunset – I’d never been to Florence before so it was a great way to see the city for the first time. Throughout the week, we went to about 11 different sites altogether, so it was a lot to take in, and safe to say by the end of the week we were exhausted! In terms of how the trip fits into my degree, it was for my ‘International Field Trip’ module for Art History. Whilst we were there we had to keep a logbook, in which we wrote about each site we went to and our experience of seeing artworks in situ at each site. We also had to make a film in groups, so we took video cameras with us and filmed snippets of each day. In addition, we have to submit a 3000-word essay for the module in April, comparing an artwork viewed in situ (i.e. an altarpiece at a Cathedral in its original location) to an artwork viewed in the Uffizi gallery (i.e. an artwork that’s been taken out of its original location and now lives in a gallery). That being said, even though we were there for our module and to learn, it was a lot of fun! We all had ‘whisper guides’ which meant that our lecturer could speak quietly into a microphone about a certain piece of art, and we could also listen no matter how far behind we were. We definitely looked like tourists! The highlights of the trip were the ceiling of the Cathedral (painted by Vasari in the 1500s), seeing Michelangelo’s David at the Accademia, and the Uffizi gallery, where we saw lots of famous paintings including Botticelli’s ‘Birth of Venus’. It was any art student’s dream! Going on trips really helps you to get to know the people on your course, and it also gives you the chance to learn by seeing things in person, which is so important! So it’s a win win situation. If your considering applying to university (I hope I can tempt you onto my course! ), or are unsure of going on a fieldtrip that your course offers, I would say go for it! It’s not every day that you get to go on a fully-funded trip, and also get a free tour guide of the whole entire city with a lecturer who specialises in Italian Renaissance Art! It also snowed towards the end of the week, so we saw a snowman by the Ponte Vecchio – a site I didn’t think I would ever see! What made our trip even more memorable was the ‘Beast from the East’ (the huge snow storm that Plymouth had on Wednesday until Saturday whilst we were in Italy), which prevented us from coming home! We ended up having to stay in Italy for 3 extra days because our flight was cancelled. After a few hiccups and a lot of organisation on our lecturer’s behalf (he is amazing! ), we ended up travelling to Turin and having a lovely day looking around the palace there. Easy Jet treated us to a 4-star hotel and with 3 course meals and the most amazing all-you-can-eat breakfast, we weren’t complaining! The trip really made me realise that Art History is where my passion lies, and I really want to work as a curator in a gallery like the Uffizi in the future. Due to the time of the year, lots of artworks were having restoration work done to them, so it was really interesting seeing the work that goes into preserving these artworks too. Thank you Art History for the most amazing trip!